Consisting of two Flicker-Free High Frequency lights and lamp arms. 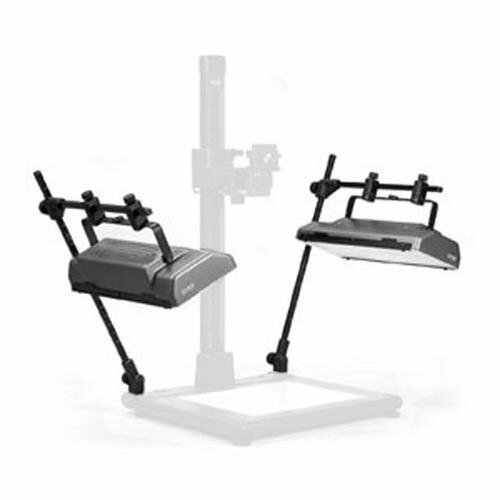 These Light banks offer even and soft illumination because the size of the lamps matches with the base plate size. It connects to and is operated via copylizer eVision exe.cutive. ( #205212 only ) and attaches to specific holding fixtures of the illumina base. All of the switches and connections are on the illumina base. Each side light has two 36 watt daylight fluorescent lamps. Both of the reflectors are tiltable and adjustable in height and can be swiveled individually. By creating product families Kaiser offers units with a perfect price-performance ratio for all kinds of application and users ranging from professionals to amateurs. By using a high level of modularization and a broad range of accessories Kaiser can also fulfill individual requirements.